Today is a very exciting day for me because I have another opportunity to host an extra-special guest on my blog. On this occasion I’m very privileged to welcome American actress, jazz and blues singer and writer, Elaine Thomas. Elaine should be here any minute, so while I go and put the kettle on and crack open a packet of chocolate digestives, here is a little bit of background on her. 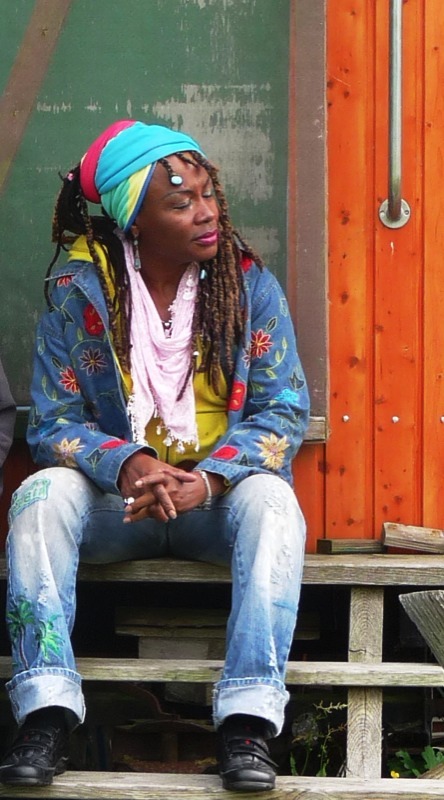 Currently residing in Hamburg, Germany Elaine has performed with some of the greatest names in international black American music: B.B. King, James Brown, Randy Newman, The Black Gospel Pearls (as lead vocalist), Alphonzo Mouson, Achim Kück, Jean Carne, Norman Connors, Sun Ra, Harlem Jazz Band, Gil Scott Heron to name just a few. Elaine started her career at 14 as a hip hop and breakdance competitor; achieving 3rd in a “Best Breakdancer in the USA” competition when she was 17 and No. 1 female breakdancer in the USA. 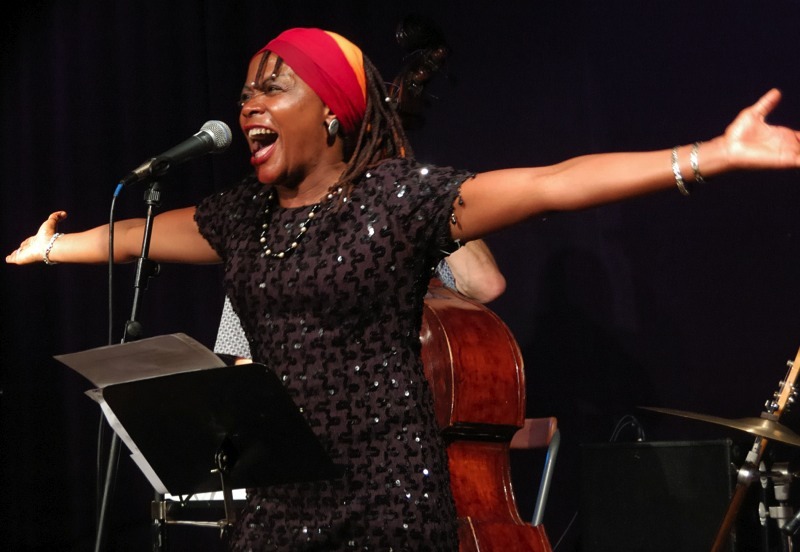 At 15, Elaine, (then known as Camille Thomas) auditioned for the famed Workshop for Careers in the Arts in Washington D.C., becoming one of the first graduates from the Duke Ellington High School for the Performing Arts, also in Washington D.C. This earned her positions with The Touring Co. Theatre West, Robert Hook’s Black Repertory Co., Back Alley Theatre – A Raisin in the Sun, Miguel Pinero’s Short Eyes, Jesus Christ Lord Today. Elaine has performed in Germany in over 15 Musicals and as an actress in just as many theatre drama plays including Jesus Christ Superstar, Hair, Chicago, West Side Story, Man from La Mancha, Kiss me Kate and with Aretha Franklin, James Brown and Cab Calloway in The Blues Brothers. She has also worked with Claus Peymann and Heiner Müller. 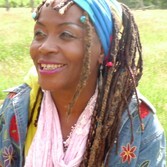 Elaine has since worked on several Compilations – Dance Floor, Classic Soul, Jazz, Pop & Gospel. The last Project, a CD – from Mr Confused Do you Realize was released in July 2012. Elaine is currently working on her first short story compilation book of black American folktales and inspirational stories for kids. Hi Elaine and welcome. Thanks for nipping over from Hamburg to be with us. Hi Richard, thank you so much for inviting me here. I must admit that when I first approached you for an interview, I thought I would be interviewing a very accomplished jazz and blues singer “only”. I was amazed when I read up on your career and realised that you have done so much in your life. We will come to that later, but to kick off, can you tell us where it all started? Where were you born and did your parents have any influence on the direction you took? I was born and raised In Washington DC; strict catholic parents…private school, strong disciplined daily life with lots of housework chores! I think that all influenced me to rebel. How did you start singing and do you remember the first time you sang? I started singing as a very young child, everything I heard on the radio, which was on constantly. Especially gospel and soul. When I was punished or depressed or even very happy…I would close the door to my bedroom, which I shared with 2 half-sisters and two aunts, and just sing my feelings out! What brought you to Hamburg? I previously lived in Hannover, where I raised my two Black German sons and did my touring from. Saw Hamburg and fell in love with the architecture, the wharf, the multitude of bridges! Wow! An absolutely amazing city. Who are your main musical influences and why? I think everything that I heard as a child, the influences of my religious background. My stepmother was Baptist, so every Sunday after Mass, we would go to the Baptist church for the rest of the day. Billie Holiday, Sarah Vaughan, Dionne Warwick, the Stax folks, Motown Sound, all of that! For me, music, at first was a way to escape the mundane of an overly protective family. Work out emotions, have fun…party, dance…that kind of stuff. I note that you have worked with some incredible people over the years, so I hope this doesn’t sound like a stupid question, but have you ever worked with anyone who was also a great idol of yours? I was once on the same show with Dionne Warwick. But we just happened to be on the same festival…as with BB King and a couple of others. Gil Scott Heron was an idol. Worked with him. He used to come by our house. At that time, I was just out of the High School for Performing Arts and lived with 24 other artists in one house! We’d jam and he’d let us come on with him and perform. How does spirituality influence your work? I left the Catholic Church at 17 and turned Buddhist. What I learnt during my Buddhist studies….ridding your mind of mental poisons, using kindness towards others every day, gave me a guideline for everything. What is your favourite song or album of all time? Donny Hathaway’s Someday we’ll all be Free. I also have a new Band named Elaine Thomas & the Poets Messengers. We do poetry to fusion jazz, some of our heroes, especially people like Gil Scott Heron or even Marvin Gaye. Try to bring a positive awareness while having a good time at the same time. OK, I’ve got to do this to you; what was the most embarrassing thing that ever happened to you whilst on stage? Going back to my drama school as a young professional and falling on stage during a jump! I could have died! Well thanks for sharing that gem with us Elaine. I said at the outset that I was amazed at the amount of things you have done in your life. But what I find incredible is that in amongst all the singing, acting and writing, you are also an English teacher. So, tell us a bit more about your work away from the stage? I got tired of always being on the road. My second son also needed more of my time…English has always been a passion of mine…so I started teaching it too. Keeps me on my toes, Richard! Well, once again time has beaten us. All that remains is for me to thank Elaine once again for a very enjoyable and insightful chat. Before you go Elaine would you just like to leave us with a few words of wisdom; maybe a favourite quote? From me- Contemplate life, stay kind, accept and believe in yourself, live now and get closer to Mother Nature. And most important, laugh, dance and enjoy what you have. Be thankful. Thanks so much for that Elaine. I don’t want you to miss your bus so I will say bye for now, and hey, take some of those digestives for the journey! This entry was posted in Guest Writer and tagged Achim Kück, Alphonzo Mouson, Aretha Franklin, B.B. King, Back Alley Theatre - A Raisin in the Sun, Best Breakdancer in the USA, Billie Holiday, Buddhist, Cab Calloway, Chicago, Clause Peymann, Dionne Warwick, Donny Hathaway, Duke Ellington High School for the Performing Arts, Gil Scott Heron, Hair, Hamburg, Harlem Jazz Band, Heiner Müller, James Brown, Jazz & blues singer Elaine Thomas, Jean Carne, Jesus Christ Lord Today., Jesus Christ Superstar, Kiss me Kate, Love Child from Diana Ross, Man from La Mancha, Miguel Pinero's Short Eyes, Motown, Norman Connors, Patches by Clarence Carter, Randy Newman, Robert Hook's Black Repertory Co., Sarah Vaughan, Stax, Sun Ra, The Black Gospel Pearls, The Blues Brothers, The Touring Co. Theatre West, Washington DC, West Side Story by Bloggin With Rich. Bookmark the permalink. What a great interview and such a fascinating lady! I loved Patches by Clarence Carter – now off to see if it’s on YouTube – such a great song. Wishing you all the best Elaine!